Quick Recap: I need an implant for a front tooth and I’ve been going to NYU Dental School because it’s the least expensive. Last week I got my final treatment plan and it’s going to cost me anywhere from $10,705 – $12,260. A tooth next to the bad one is borderline. If it’s salvageable it will be the lower cost, if not, the higher. Either way, good lord. Today I’m going to another dentist for a second opinion. But a kabillion doctors at NYU have already looked at my case (it’s an interesting and complicated case, apparently) and I really don’t believe they’re out to scam me. This guy, on the other hand, was looking so friendly! I saw that he was smiling, but I have to take my glasses off to take pictures (I’m near sighted) and I didn’t see how nicely he was smiling. 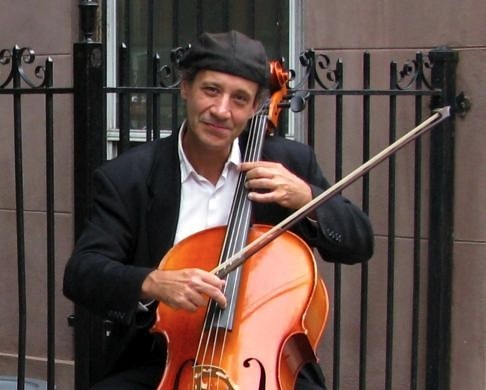 Playing cellos on the corner at night has become a thing in my neighborhood. Is it always him, but on a different corner? I will have to pay attention from now on and see. It’s very nice to hear the music when I’m walking home from wherever. Gosh, that is high. My front tooth implant was $6K, but I was also in the middle of braces which was another $6K. And the braces would not align my top teeth unless I had the extraction and the implant. I am saying prayers that your new book is a HUGE success and teeth and cats are nicely taken care of and you get to buy a wonderful old building for you and all your friends and their cats/dogs/etc. to live in!! Wow, had no idea tooth implants were that high. I have dental insurance, but it’s getting like the medical ins. — high deductibles, with high co-pays (i.e. scams!). It does pay for 2 cleanings/1 set of xrays each year. But I am overdue for a couple crowns on the bottom, and at $750 EACH, my copay is about $500. I haven’t even looked at the fine print to see if it would cover anything like a tooth implant. My uppers are in good shape; all crowned (done over years)…but bottoms are a continuing expense. I’ve threatened to just get the bottoms pulled, and get a set of bottom false teeth. Altogether I bet it would cost less than two crowns! Good luck with the implant. One of my aunts had an implant (years ago) and she had some trouble because her body rejected the implant…but that was years ago, and I’m sure they’ve improved the process. The cost is higher because I have to have four crowns redone— this tooth is one of four teeth all next to each other that have crowns. Two would have to be redone, and to make sure they match we’re redoing all four. I’d probably save around $3,500 if I didn’t have to do this. But thank you both. Ugh. I wish I didn’t have to do all this.